Mere hours after Joe Biden published a video where he vowed to be "more respectful" toward women after a controversy over his history of "inappropriate" physical contact with women exploded onto the front pages, three more women have come forward to the Washington Post to share their owns stories about their encounters with the former Veep, bringing the total number to seven. All three women told WaPo that Biden's unwillingness to apologize for his behavior in his grand mea culpa video had offended them, and said it had become clear that Biden was "struggling to understand" exactly why his actions were inappropriate. This isn't about sexual assault, one woman said, it's about power dynamics between men and women. Vice President Biden with Sofie Karasek, one of three women who spoke with the Washington Post. One woman described how Biden had touched his forehead to hers during a widely photographed moment that she said was "kind of inappropriate." "He then put his hand on the back of my head and pressed his forehead to my forehead while he talked to me. I was so shocked that it was hard to focus on what he was saying. I remember he told me I was a 'pretty girl,'" Kohnert-Yount said in a statement to The Post. She described feeling uncomfortable and embarrassed that Biden had commented on her appearance in a professional setting, "even though it was intended as a compliment." "I do not consider my experience to have been sexual assault or harassment," she stated, adding that she believes Biden’s intentions were good. "But it was the kind of inappropriate behavior that makes many women feel uncomfortable and unequal in the workplace." Another woman described meeting Biden when he introduced Lady Gaga at the Oscars in 2016. She was part of a group of sexual assault victims who appeared with the singer. When she met Biden after the ceremony, he once again did the forehead touching thing - one of his signature moves - in front of a bevy of cameras. The third woman was a Democratic staffer during the 2008 campaign. She met Biden at a reception for 50 people that she helped organize. She described how Biden delivered an unwanted hug that lasted "for a beat too long." She now runs a nonprofit that fights sexual harrassment and said she felt duty bound to speak up. Ally Coll said she was a young Democratic staffer helping run a reception of about 50 people when Biden entered the room. She said she was then introduced to Biden, who she said leaned in, squeezed her shoulders and delivered a compliment about her smile, holding her "for a beat too long." "There’s been a lack of understanding about the way that power can turn something that might seem innocuous into something that can make somebody feel uncomfortable," said Coll, who consults with companies about their workplace policies. 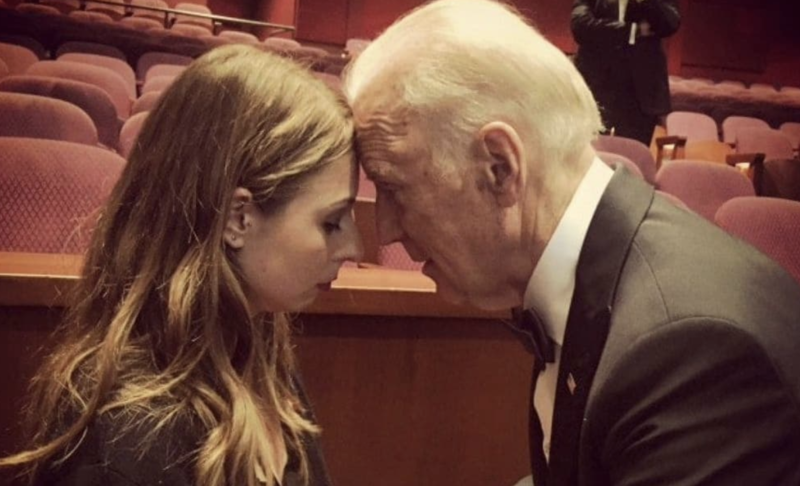 In Biden's defense, one woman who spoke with WaPo said the touching foreheads maneuver was a common gesture Biden employs with men and women (probably to try and convey, in pictures, that he's a genuine "tactile" politician). But with Biden reportedly set to declare his candidacy before the end of the month, his campaign-in-waiting has been thrown into disarray, and his top advisors are searching for scapegoats in the crowded field of Democratic rivals vying for the 2020 nomination. If this report makes one thing clear, it's that this scandal isn't going away. And before it's over, Biden, who is also facing renewed backlash over his role in the Anita Hill hearings, when he led the Senate committee that interrogated her, might find support for his candidacy has significantly diminished. However, he has had one unexpected defender throughout all of this: President Trump, who has said Biden shouldn't apologize. Maybe the president is working with Biden's rivals, too?